Teams were heading to the buses as the contestants in the boys long jump raced down the runway for the final time. Clarksburg's Paul Joseph and Seneca Valley's Darius Lewis were among those wrapping up a long day at the Prince George's Sports and Learning Center while timers packed away computers and camera equipment. Lewis had already clocked the fastest MoCo time of the day in the 55-meter hurdles (8.25). His explosive style in the long jump launched him to a new personal best mark of 21-00.50. Paul Joseph had a personal best jump of 21-05 on his first jump and 21-05.50 on his third jump. It was the third best indoor jump by a county athlete in the last five years. He jumped over 20 feet in all of his six jumps. He finished second behind Digital Harbor's Michael Francis. And so wrapped up a day where Montgomery County athletes competed hard, set personal bests, and came excruciatingly close to victory nearly a dozen times. No one came closer to victory than Clarksburg's Bailee Freeman who tied the top performance in the high jump with a leap of 5-02 but took second place based on misses. No one had a more gut-wrenching second place finish than Churchill's Nadim Elhage who created a large lead after his second throw with a mark of 50-06.75. 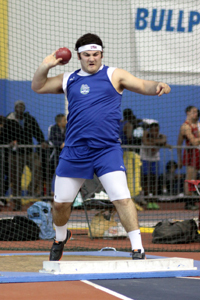 Elhage returned for the final three throws some time later in the day but could not regain his 50+ foot form. Rashad Manning of Riverdale Baptist, a freshman who is an AAU junior olympic champion, launched a throw of 51-04.25 in his final opportunity. Elhage had one final chance to regain the lead, but came up about two feet short on his final throw. He said that he did not throw throughout winter break, choosing to lift instead. Racing to a victory in the prelims, the Northwest girls clocked a county-leading time of 1:44.97. It was a dominating performance in which Kennedy Knight took a commanding lead after receiving the baton from Hayley Henshaw. India Knight and Camry Torian ran unchallenged. The same team found more of a challenge in the finals as Henshaw handed off in second-to-last place and Kennedy Knight only pulled the team into third place. India Knight gained a slim lead on the third leg but it wasn't enough for Torian to hold off Osbourn Park's flying anchor leg. Northwest took second in 1:45.15. Osbourn Park won in 1:44.80. Northwest also claimed second place in the 4x800 with a time of 9:55.44. Gaby Go led for some of the first leg and handed off in fourth place in 2:30. Naomi Sheppard moved the team into second place with a 2:24 split. Sula Ndousse-Fetter challenged Archbishop Spalding and took the lead briefly on the third leg but handed off to India Knight 3 seconds out of first place with a split of 2:30. Knight split 2:30 to finish second behind Spalding. Northwest took second place in the final heat of the 4x400 at the end of the day, but actually placed 3rd overall when all heats were combined. Freshman Katerina Lake handed off in about second place with a 62 second split. Northwest held onto second place throughout the race with splits of 61 from Kennedy Knight, 63 from Tiara Wellman, and 61 from India Knight. The overall time was 4:07.19. Wrapping up the highlights by the Northwest girls, Camry Torian finished second in the finals of the 55-meter dash with a county-leading time of 7.24. Northwest was not the only team with girls getting it done. B-CC's Brittney Wade had one of the best days of her high school career. She won the seventh heat of the 500 with nobody else around in a personal best time of 1:18.33. The time held up for 3rd overall. The final heat of the 800 was more competitive for Wade. She tucked into the middle of the pack through 400 meters with a 1:08 split. On the third lap, the pack began to stretch and Wade picked off runners one-by-one. She was in third with a lap to go and passed one final runner on the last lap to take second in 2:19.12. The only girl to place in front of her was from a Philly-area school. It is the best recorded time in the county this year by nearly nine seconds. There have been some loaded 55-meter hurdle finals over the years at the Montgomery Invitational, but this girls field may have topped them all. I think back to when Thersa Lewis set the meet record in 2005 and a few years later when Letecia Wright and Audrey Gariepy-Bogui emerged as great hurdlers. But this year's field had unmatched speed, strength, experience, and depth. Ultimately seven girls ran under 8.50, and then there was Walter Johnson's Laura Dally in 8th place in a personal best 8.53. Not only did she take over this year's county lead, she moved up to fifth in Montgomery County in the last five years. 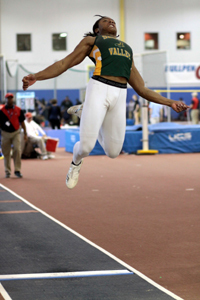 Dally was also fifth in the triple jump with a mark of 35-06, a best mark for indoor season. This outstanding performance by Laura Dally sets up an exciting matchup between Dally and Wootton's Gwen Shaw at the upcoming county championship. Dally had not previously beaten Shaw this season and Shaw still had a strong clocking of 8.76. Shaw also had the top county time in the open 300m (42.96, 9th). Caroline Guiot of Whitman and Lucy Srour of Churchill were featured in the elite 3200m along with a number of talented girls from Virginia. After the first 800 meters, Sophie Chase of Lake Braddock made her intentions clear that she planned to run away with the race. Srour was near the front of the chase pack in third and ran through 1600-meters in 5:40 while Guiot was tucked somewhere in the middle around 7th place. Over the course of the second mile, Guiot picked up the pace and began to pick off runners. With only a quarter mile left, the second place runner from Washington-Lee was in her sights. She came up about a second shy of second place, finishing third in 11:25.04. Srour faded to 8th in 11:39.69. 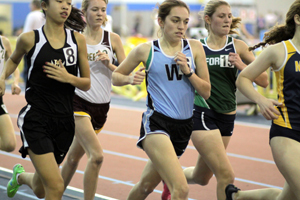 She had a look of disappointment after closing the second half of the race in 6:00, but her time still ranks as the fastest indoor 3200 by a Montgomery County Public School freshman in the last five years. The B-CC girls fared well in the distance medley relay, taking advantage of an impromptu race within the race. B-CC had a seven second lead over Clarksburg entering the 1600m leg. B-CC was not leading the race, but Clarksburg's Abbey Daley keyed off of B-CC's Ava Farrell to close that seven second gap within the first 800 meters. Daley and Farrell exchanged places a few times in the final 800 meters before Farrell pulled away to beat Clarksburg by five seconds. B-CC was fourth in 13:16.40 and Clarksburg was fifth in 13:21.73. Daley earlier had clocked the fastest mile time of the day by a Montgomery County girl, 5:16.51. In the boys distance medley relay, WJ's Scott Sheehan led all runners through the 1200-meter leg with a split of 3:18 while QO's Evan Burnham was right behind him. Loyola Blakefield High School gained the lead on the 400-meter leg and never relinquished it. QO and WJ would run step for step for the rest of the race. 400 and 800 splits were approximately 56 and 2:07 for both QO and WJ. On the anchor leg, WJ's Josh Ellis and QO's Evan Laratta swapped 2nd and 3rd place several times before Laratta pulled ahead in the final 25 meters. Each split about 4:39 to finish in 11:01.29 (QO) and 11:01.93 (WJ). Loyola's anchor leg ran 4:27 to win the race in 10:46.81. Laratta had just completed a 3200-meter race in 9:36.47 less than 30 minutes before the DMR. Ellis had run in the open mile and finished fourth in 4:25.36. 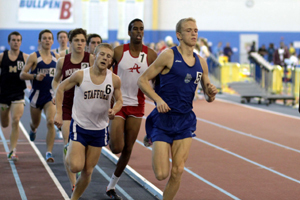 In the boys mile, the field feared Annandale's Ahmed Bile who was the Virginia cross country state champ, footlocker qualifier, and entered in the race with a seed time of 4:09. But Bile did not force the pace. What transpired was a deadlocked race with nobody moving until the final 400 meters. Churchill's Will Conway inadvertently took up the rabbit duty for Bile. Conway, who said that he was surprised the no one else wanted to take the lead, ran perfectly even splits of 33 seconds per lap until Bile made his move on the penultimate lap. It was a mad dash to the finish and Bile had the best kick to win in 4:21.21. Conway was third in 4:24.18 and as previously mentioned, Josh Ellis of WJ was fourth in 4:25.36. Conway thought that he ran a good hard race considering the circumstances and was happy to have outkicked one particular runner who won the 1600-meter race at the PR Invitational. "I've done a few workouts since then," he explained. Conway also came away with the fastest Montgomery County 800-meter time of the day with a fifth place 2:02.30. One Montgomery County athlete did actually win an event: Joey Chapin of Georgetown Prep in the 1600. Of course the 1600 and the mile are nearly identical events and most of the top milers entered in the mile, but Chapin and his coach opted for the 1600 where he would most likely dictate the pace instead of pacing behind someone in a potentially slow, tactical mile. Chapin took the lead early in the race before he allowed Stafford's Ian MacLeod to lead. Chapin regained the lead before the 800-meter mark and split 2:14. He held this pace and runners began to drop off. He split 30 seconds on the final lap for a winning time of 4:25.53. Georgetown Prep's Ron Busby was disqualified in the 500m for taking three steps inside his lane, but he certainly could have had the fastest Montgomery County time of the day had he not been DQ'd. He finished ahead of RM's David Hamilton, who officially had the fastest county time of 1:07.97, good for fifth place. Georgetown Prep's Bryson Hoover-Hankerson and Nick Gruenwald each jumped 5-10 on a day when the high jump was won in only 6-00. Paint Branch's Tyler Nelson had the top county mark in the triple jump (43-03, 4th). Churchill's Micah Phillips-Spencer, in his first meet of the season since the scrimmage, came away with the fastest county times in the 55-meter dash (6.75, 9th) and 300m (36.27, 8th). 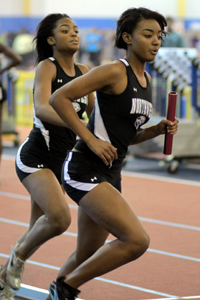 Watkins Mill had the fastest county 4x200 (1:34.30), Richard Montgomery had the fastest 4x400 (3:34.83), and Paint Branch had the fastest 4x800 (8:33.51). PLEASE spell Theresa's name correctly on the heat sheets. Thank God it's correct on the record book. Oh thanks because I was telling someone recently watching Letecia, Audrey and Takecia put on hurdle shows was the best. College wasn't the same!! Tell Audrey's mom hello. I HATED Audrey got injured in college. So many GREAT MD high school hurdlers (Christina Manning, Westlake) joined Letecia as a Buckeye (welcome Alexis, Old Mill). I read this board (and running MD) often so keep up the GREAT work!!! 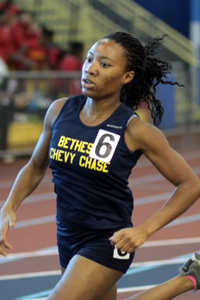 So I hear no one repeated Letecia's double (55/55H) at Mont Invite and she was trained by the GREAT Theresa Lewis!!! !